“A sure sign of an unhealthy culture is communication that flows down rather than up and across.” My experience is that most executives and managers think they’re great communicators (! ), and even if they are, don’t recognize the importance of continuing to learn and practice with EVERYONE in the organization. How’s your company’s communication practice going? I’m interviewing to become the first HR Director for a business-to-business services firm. I’ve had two interviews and I really like what I’ve heard so far. For my third (and I believe, final) interview, the regional President who will interview me has asked me to prepare questions for him. I do have questions for him, but I want to focus in on his Business Pain as I’ve learned from you to do! If they didn’t have significant pain, they wouldn’t be replacing their former HR Manager (who moved out of state) with an HR Director now. The company outsources its payroll, benefits and HRIS to a third-party vendor. Everyone I have met in the company says that the vendor does a great job. So, I think the region’s Business Pain is more in the area of culture, which is not surprising because they are growing fast and hiring a lot of people. What are some of the most common culture problems you observe, and if you can share them in a few words, how do you solve the most common problems? I want to talk about my experience creating training programs, communication programs and retention programs as I think these kinds of interventions could be very useful for my (hopefully) new employer. Often as HR practitioners we are taught to see the world through program-colored glasses. That is, we get used to observing a team and a workplace with the question, “What do these folks need — more training, more communication or a different pay structure?” planted in our heads. Pain shows up in little ways at first. Your regional President (I’m calling him Mike) undoubtedly runs into daily or many-times-daily issues that make him wonder “Are we doing everything we need to do to keep this team focused and connected as we grow?” The answer may well be “No.” It’s very hard for growing companies to keep all the pieces together. Small companies tend to grow a ton in a short term and then overreact by installing too much HR infrastructure (and the worst, crusty kind of infrastructure to boot). They rush to install formal systems like 360-degree feedback programs and annual Employee Engagement Surveys. The Institute of Medicine’s To Err is Human came out in 2000, estimating that we are killing over 100,000 people a year with the way we practice medicine in the U.S. An updated September, 2013 study in the Journal of Patient Safety reveals that each year preventable adverse events (PAEs) now lead to the death of 210,000-400,000 patients who seek care at a hospital. Those figures would make medical errors the 3rd leading cause of death behind heart disease and cancer, according to Centers for Disease Control and Prevention statistics. One direction of correction we need to pursue is to get out of our respective silos, and learn to communicate and collaborate. PAE’s harm, waste and deaths are linked to a long history of top-down, abusive relationships among the professions, fighting between doctors and nurses, and various other wars within organizations that oddly tout patient care as their number one priority. It would seem that “healthcare” would be better achieved if an integrated plan were used. Exit the silos, learn about other disciplines, “cross-pollinate” the information for the best of service delivery, and empower the patient in the process. Sounds like a perfect opportunity for team building and leadership, doesn’t it? Many studies have shown that people like people-centric, relationship-centered, hands-on disciplines. Since we know that 45 to 85 percent of people with chronic conditions explore one or more forms of “alternative medicine”, then the only way to be patient-centered in healthcare delivery is to include on the teams the practitioners who are experts in those areas. The problem with this approach to team-building is that business likes the margin on products that are more expensive. Medical business favors sick people over well people, and tertiary care provides the highest margins. So why would they want to extract the most value to health out of a chiropractic adjustment, a therapeutic nutrition consult, an acupuncture treatment, or an hour spent in assisting behavior change?…..especially if the outcome would keep people from needing the high-ticket interventions on which their business model is based. Healthy, empowered people are the antithesis to medicine’s profit centers. The good news is that the bad news is causing a rumbling about the meaning of health, how individuals might be coached to self-empowerment and well-being, and the transformative cultural shift that has begun to affect healthcare delivery. These outcomes are emerging in policy discussions, federal health law, and organizational practices. Using the IOM’s Triple Aim of values over profits (better patient experience, enhance population health, and lower per-capita cost), we are entering an era where health systems might actually get paid to keep people healthy! The Affordable Care Act has vastly increased the recognition of licensed integrated practice fields such as acupuncture and chiropractic. There are sections within this law that clearly stipulate non-discrimination in reimbursement, research, health promotion and prevention, work force development, and delivery models such as Patient Centered Medical Homes. All of this is creating a patient-centered, team-based, health-focused, community-oriented future for medicine. In order to continue the momentum of this movement, we’ll need to learn and practice the roles of leader, “change agent”, advocate, navigator…..any position that puts a premium on communication and collaboration. To quote John Weeks at the 2013 NYCC commencement address: “Go out and create relationships. Populate that picture of you with at least one of every other type of practitioner or service provider that may at some time be useful to a patient. Create your own circle of care of medical specialists, nurses, other integrative health providers, addiction services, and farmers markets. Stop the cycle of self-inflation and polarization that are bred by silos of education and practice. Continuously invest in these relationships even as you consult and refer unto others as you would have them consult and refer with you”. The time has come us to put on our big person pants and do things differently. We must grow with the movement in health and medicine toward respecting the whole person, putting the patient at the center, focusing on health, and teaming with others. As an independent RN Patient Advocate, I’ve seen many scared and confused workers who don’t trust their companies or know where to turn. When advocates are employees of (paid by) the company, they’re aligned with the organization’s strategies, and the injured worker knows that. Why not have a professional independent contractor with advocacy, health education, and medical navigation experience on “retainer” to call on when needed? They’d skillfully offer an objective position, and provide excellent opportunities to open channels of communication throughout the organization. Advocacy is one of the most talked about concepts within the industry and holds the potential for redefining the claims process as we know it today. This session at WCI’s 2016 Annual Workers’ Compensation Educational Conference explored advocacy from a range of perspectives to show how such an approach can benefit virtually any claims program. Advocacy puts the injured worker at the center of the claims process while stakeholders strive to provide an improved customer experience and achieve a positive outcome for that individual. While an advocacy model can take many forms, one of its core components is communicating more effectively with the injured worker from the very beginning. It also entails providing transparency throughout the overall workers’ compensation process. Currently, there is no consistency in the system. Are we hiring empathetic people to take care of our injured workers? As an industry, we seem to be shifting far from that and placing greater concern on processes and costs. Also, there is a great need for advocacy because a litigated claim is a huge cost factor for employers. How we care for the employee through the workers’ compensation process has a huge impact on these outcomes. An advocacy claims model can include the insertion of an objective person who is familiar with the workers’ compensation process but is not necessarily the same individual who will be deciding the claim. CenturyLink has an employee whose sole responsibility is to regularly contact injured workers every two weeks to see how they are doing, walk them through the process, customizes their return-to-work efforts and, overall, serves as an approachable resource. This process has taken often scared and confused employees and has helped gain trust from them, gets them engaged in the process and helps them return to work faster. From a physician standpoint, advocacy means uncovering what the patient understands about the medical process to determine any misconceptions. This is not a one-size-fits-all conversation. A standard lecture will not work. If you specifically address what the patient expresses as concerns, they will listen. A respectful conversation makes a huge difference because the patient decides their own willingness to heal. There are several studies that show that patients who feel like they are heard did much better than those whose progress was tracked through numbers. We are all better together in creating an advocacy-based approach. Your service providers can be huge allies in making the shift into how we engage and communicate to injured workers. Building trust does not happen in silos and, with a multitude of communications tools available to us through technology, we are well poised to work together on this. Key performance indicators include measurement of experience factors. Of course reduction in litigation rates can indicate success of a program, but let’s start measuring and communicating the positive experiences. Experience really does matter and it is heavily influenced by the way we engage and communicate to our injured workers. Many of the patients I advocate for, and navigate the medical system, were discharged in an unstable condition. There is an overwhelming need for development and implementation of national hospital discharge guidelines to prevent medical errors and improve patient safety. 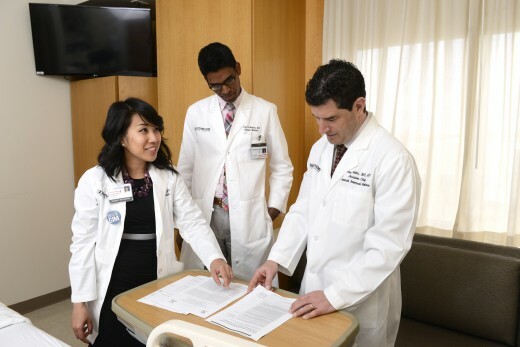 Dr. Oanh Nguyen (left), Dr. Anil Makam (center), and Dr. Ethan A. Halm (right) of UT Southwestern’s Center for Patient-Centered Outcomes Research. DALLAS – August 9, 2016 – Twenty percent of people hospitalized are released before all vital signs are stable, a pattern that is associated with an increased risk of death and hospital readmission, a new study by UT Southwestern Medical Center researchers shows. The Center works in conjunction with UT Southwestern’s Center for Translational Medicine, part of a $28.6 million grant from the NIH to promote rapid translation of basic laboratory findings into patient care. The Center is a member of a national Clinical and Translational Science Award Consortium that includes more than 60 medical research institutions. Applied “Medical” Improv is focused on honesty and spontaneity (“serious play”), rather than comedy. It’s an art form and it develops communication. Most importantly, it’s FUN! It can be designed to increase self-awareness, problem solving, empathy, collaboration and professionalism. Building teamwork empowers productive, open, and trusting partnerships to expand and flourish. It’s no longer a secret that the U.S. medical system needs help in several critical areas: questionable healthcare quality, increasing medical errors, burned employees, and poor patient experiences. Top administrators, support staff, and direct caregivers all need to keep their “soft skills” sharpened. A positive attitude, empathy, and self-awareness, along with excellent communication, team building, and problem solving are all necessary for facing today’s workplace (healthcare) challenges. Additionally, preventable adverse events (PAE’s) cause 400,000 people to die each year, making it the #3 cause of death in the U.S. (2013, Centers for Disease Control and Prevention statistics). The Joint Commission has identified Leadership, Communication, and Human Factors as the top 3 causes of PAE’s, and there’s growing interest in using applied Improv principles to offer new and innovative solutions to these ongoing, critical problems. What are the principles of Applied “Medical” Improv? A free initial consultation is available to discuss your organization’s interests, goals and budget. A planning meeting via conference call or on-site will be arranged, and a program proposal delivered. Administration, support staff, and direct caregivers are encouraged to attend the on-site workshops. Each workshop “part” is offered over 2-3 hours to each group, with varied times and dates to reach all members of the healthcare organization. An appropriate number of Improv facilitators are present, depending on participant numbers. Follow-up sessions with initial workshop attendees can be arranged to introduce additional exercises and support already implemented principles. Optional monthly meetings for ongoing staff education, shared experiences, support of the new Improv “culture”, and (eventual) staff-led “train the improviser” programs. “Medical Improv” has fairly new roots in the U.S., and there are approximately 50 professionals that have attended “train the trainer” workshops. As one of those trainers, my team and I have presented workshops for a variety of healthcare organizations looking for new, innovative ways to address patient safety, quality of care, employee retention, and medical errors. Some of the organizations who have benefited from our workshops include hospitals, home health agencies, public health programs, professional associations, academic programs, private physician groups, and others. Contact me today to find out how your organization can benefit from Improv to Improv(e) Healthcare! workshops! Stephanie Frederick, M.Ed., RN is passionate about providing positive patient and staff experiences throughout the organization by improving communication. She attended the first Medical Improv “Train the Trainer” intensive, taught by Katie Watson, JD in June, 2013 at the Chicago’s Northwestern University’s Feinberg School of Medicine.